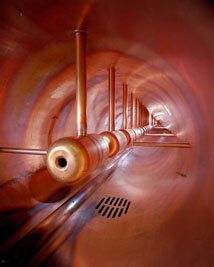 Photograph of the inside view of drift tube in older 200 MeV section of Linac. Photograph courtesy of the Fermi National Accelerator Laboratory (Fermilab) website. Used with permission. Fermilab is D-Lib Magazine's featured collection this month. Virtual Tutorials "Any Time, Any Where"
E-Books 2001: Presentations from a Conference Held March 2001 in London, England. DELOS Workshop on Interoperability in Digital Libraries, 8 - 9 September 2001, Darmstadt, Germany. Call for papers. The deadline for submission is 29 June 2001. Special Issue of Information Technology and Disabilities on the theme of "Information Technology, Accessibility, and Distance Education", edited by Tom McNulty, New York University. Call for articles. The submission date is 15 July 2001.
International Conference of Asian Digital Libraries (ICADL), 10 - 12 December 2001, Bangalore, India. Call for papers. The submission deadline is 15 July 2001. New Review of Hypermedia and Multimedia 2001, on the theme of Digital Libraries, edited by Douglas Tudhope. Call for articles. The submission deadline for articles is 1 August 2001. North American Serials Interest Group (NASIG) 17th Annual Conference, 20 - 23 June 2002, Williamsburg, Virginia, USA. Call for papers. The submission deadline is 1 August 2001. The First ACM/IEEE Joint Conference on Digital Libraries, 24 - 28 June 2001, Roanoke, Virginia, USA. 19th General Conference and 20th General Assembly of the International Council of Museums, 1 - 6 July 2001, Barcelona, Spain. Computer Assisted Assessment (CAA) 5th International Conference, 2 - 3 July 2001, Loughborough, United Kingdom. UmbrelLA 6, 5 - 7 July 2001, Umist, Manchester, United Kingdom. ELPUB 2001: International Conference on Electronic Publishing, 5 - 7 July 2001, Canterbury, United Kingdom. First International Workshop on New Developments in Digital Libraries, 6 - 7 July 2001, Setúbal, Portugal. Third International Conference on Enterprise Information Systems , 7 - 10 July 2001, Setúbal, Portugal. Grindstone Island Summer Seminar Series, weekly classes from 7 July - 1 September 2001, Grindstone Island, Ontario, Canada. Digital Resources for the Humanities: DRH2001 8 - 10 July 2001, London, United Kingdom. Digital Asset Management Conference, 9 - 10 July 2001, London, United Kingdom. Digital Cultural Heritage III: Finding Aids and Analysis Tools in Memory Institutions, 11 - 14 July, Maastricht, Holland. Digitisation Summer School for Cultural Heritage Professionals, presented by the Humanities Advanced Technology and Information Institute (HATII), 15 - 20 July 2001, Glasgow, United Kingdom. 8th International Conference on Scientometrics and Informetrics, 16 - 20 July 2001, Sydney, Australia. 5th World Multi-Conference on Systemics, Cybernetics and Informatics, 22 - 25 July 2001, Orlando, Florida, USA. Educational Technology 2001, 24 - 26 July 2001, Arlington, Virginia, USA. 5th International Conference on Information Visualisation (IV2001), 25 - 27 July 2001, London, England. EVA 2001 Scotland: Electronic Imaging & the Visual Arts, 25 - 28 July 2001, Glasgow, United Kingdom. International Summer School on the Digital Library, Session 1: 30 July - 3 August 2001 and Session 2: 5 - 10 August 2001, Tilburg, The Netherlands; and Session 3: 7 - 12 October 2001, Florence, Italy. ECURE 2001: Preservation and Access for Electronic College and University Records, 12 - 13 October 2001, Mesa, Arizona, USA. D-Lib Magazine is produced by the Corporation for National Research Initiatives (CNRI) and is sponsored by DARPA on behalf of the Digital Libraries Initiative under Grant No. N66001-98-8908. D-Lib has been registered to CNRI in the U.S. Patent and Trademark Office.